IKO Level 1, 2 & 3 in one course. Taking you from Zero to Hero in no time. Why Cyprus? Warm weather, warm water, consistent steady winds, flat water, chilled out atmosphere, family and group friendly, no strong currents and nothing in the water that can harm you (!). Kahuna Surfhouse is a fully equipped Kitesurfing and Stand Up Paddle Centre with all the facilities you need to make your stay smooth, comfortable and fun! Showers Outdoor,Toilets / Shower Indoor, Changing Room, Storage, Surf Shop, Bar, Sun bathing Area, Kite Shade, Equipment Washing,Parking, Free Wifi (Wifi Speed), Shaded Childrens Play Area. Duration: Approx 10hours. No experience needed! Basic swimming skills. It combines IKO Level 1,2 & 3 to make you a confident and independent kitesurfer ready for serious adrenalin pumping extreme sport. You will learn kite control, body dragging, self rescue and water launch within the 10 hours and have time to practice! You will also be ready to purchase your own equipment. The school is updated with new equipment every year – we are currently using 2017/18 RRD Kites and boards which are at the top of the brand league in their innovative design and safety features. All safety equipment – helmets, wetsuits, buoyancy aid are provided by the school. We use wireless, waterproof radio equipped helmets to give you constant guidance even in the water. 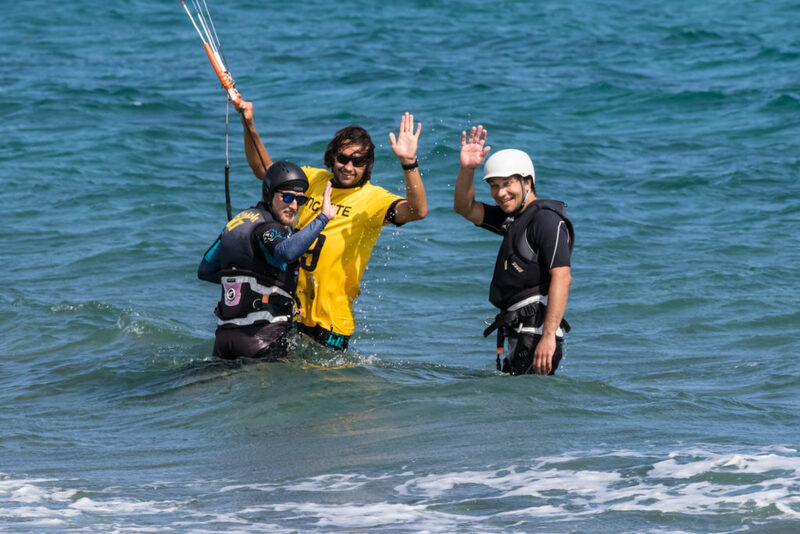 During the lessons we provide you with all the necessary equipment: kite, board, harness, flotation vest and a helmet complete with waterproof walkie-talkie so your instructor can guide you while you are practicing in the water. This is the most popular and valuable course. You will be ready to take your skills into the water independently to practice riding upwind or you can take the Riders Course to progress quicker with an instructor.